A little overnight getaway is always something that keeps me going - brightens my mood in anticipation of a quick change, if only for a night. I love that. And I have always been one to plan short trips to other cities, one or two days, when I was in college specifically. Limited time, not a fortune on the bank account, yet always a reason to see something new and expand my horizons. A couple weeks ago, I boarded a Virgin America plane at 7 am on a Monday morning, only to touch down in San Francisco less than an hour and a half later. It was only me and my backpack, including a couple things I needed for a night away from home - aka San Diego -, welcomed by grey haziness and a busy, buzzing atmosphere. I hopped in a Lyft (I tend to like those better than Uber…just a personal preference) and sure enough, we were right in the midst of busy San Francisco Monday morning commuter traffic. I enjoyed it, to be honest, though. Driving in a city with extreme traffic, a city I am not even thoroughly familiar with, stresses the hell out of me. I only manage to stay somewhat cool down here in San Diego and not freak out every time I entered downtown area. Haha. A little exaggerated but partially true. Anyway, having someone drive me through a city I just arrived in is great, as it allows me to keep my eyes left and right and soak in my very first impressions. It was my third time in what locals oftentimes refer to as “The City”. Each time I tried to give San Francisco a chance and be impartial. I know many people are obsessed with this city. But that will be another topic for a #USLiving post. Now, after I checked into my hotel - I stayed at The Embassy Hotel in Civic Center, and I didn’t pick the right area, nor the most glamorous of hotels, that’s for sure (gotta watch your pennies, especially here) - another driver gave me a Lyft to the San Francisco Food Bank. The SF Food Bank is where I should be volunteering that day with many other young people currently in the bay area. It was a cheerful event that also left me thinking way beyond those few hours that we were packing plums and carrots for families in risk or currently in hunger because of the disgustingly rising prices up in the bay area. The tech industry might be flourishing; there might be a number of rich people; but there is a downside, and that’s the people that from “normal, average (whatever that might mean) income cannot make a decent living anymore. They are struggling. And what stuck with me the most was the fact that apparently one in four families are in risk of hunger. Just let that sink in for a moment. That is mind-blowingly sad. So, giving back a little bit, not even a fraction, yet helping those who slave away hours and hours in the food bank to give those people the nutritious food they need and deserve - and helping them keep their dignity - was refreshing. I got back to the hotel to change in the later afternoon and set off on foot, on a mission: Finding the Painted Ladies. (Last time Rickey and I had a few hours in San Francisco, we weren’t really successful, haha.) Undoubtedly, this is one of the points of interest in the city. Full House feels galore. With my camera in hand, I made my way towards the ladies. I started walking and after a few minutes kind of regretted I didn’t order a ride, just because, well, it’s a city I am not familiar with and the neighborhood I was walking through didn’t seem to be the most pleasant or friendliest one. There were quite a few shady looking people including a bunch of homeless. So, I walked faster. After 20-25 mins or so I finally saw it: Alamo Square. 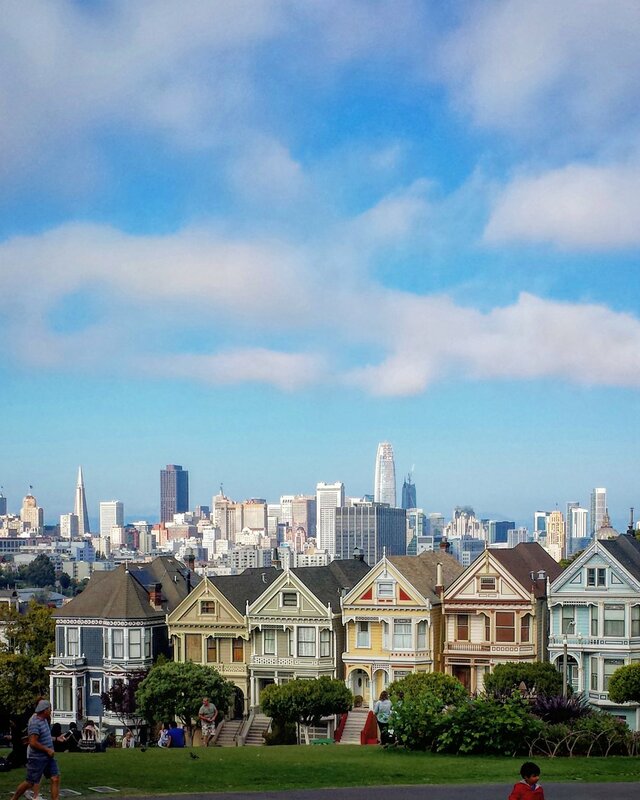 And yes, I was at the right place as it was definitely a busy place with a lot of visitors being busy taking pictures of the iconic houses - The Painted Ladies. I walked around Alamo Square for a while, watching people play with their dogs in the adjacent dog area. A chilly breeze was coming up. I hung out for a while and soaked it all in. And that was it. I called it a day, listening to the buzzing, yet soothing traffic noise outside of my hotel window while munching on my chicken. San Francisco, I think we need to have a chat at some point. Just not today.